At a tea party for East Kent Independent Dementia Support on Friday 18th October, hosted by the Rotary Club of the Isle of Thanet Sunrise at St Philip's Church, Palm Bay, Past President Chris handed over a "Sing For Your Life" MUSIC BOX to Tessa Read, Chairman of EKIDS. 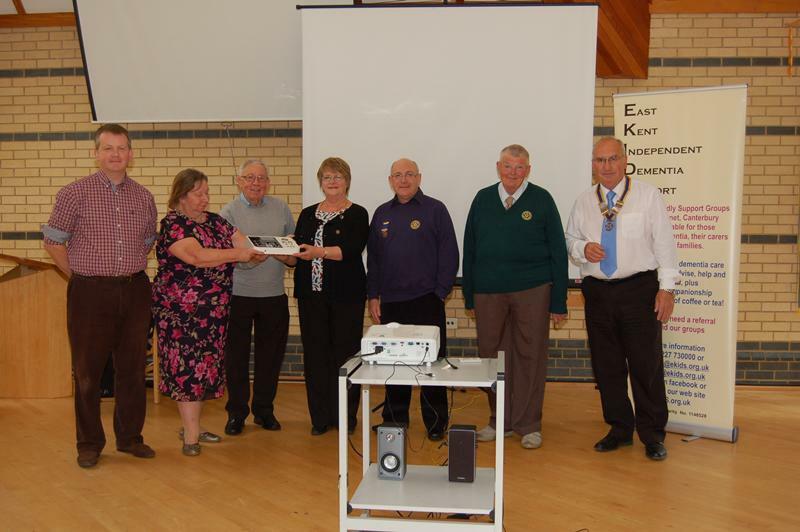 Both the Rotary Club of Westgate & Birchington and the Rotary Club of Ramsgate had chosen "Sing For Your Life" as their President's charity in 2012 - 2013 and had previously given large donations to Adrian Bawtree, the Programme Director of SFYL to fund further research and provide MUSIC BOXES. After careful research into likely usage, it was agreed that a MUSIC BOX should be given to EKIDS for use at their many day centres throughout East Kent. In addition to Rotarians and members of EKIDS, some 30 dementia sufferers and carers attended the Tea Party and, before being served a comprehensively excellent tea, enjoyed a lively sing-along led by Adrian Bawtree, who demonstrated what the MUSIC BOX could do.